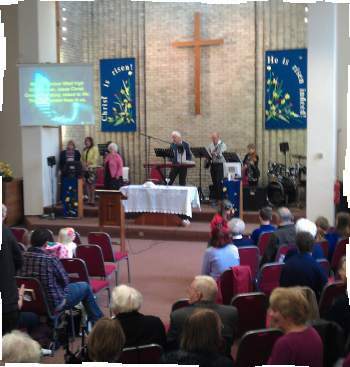 Worship takes place every Sunday at 10.45am and is led by the Praise Group. It is contemporary in style and includes a mixture of modern worship songs and traditional hymns, prayers and Biblical themed preaching. There are also groups for children and youth from 3 - 16 years and a creche for those up to 3 years. All Age, BB & GA Parade Services are normally on 2nd Sunday each month. Coffee and tea are served in the lounge after the service. The church has an induction loop, hearing aids should be set to the ‘T’ position. Please turn mobile phones off. (identified by red badges) will be happy to do so. Please make yourself known to them.